CompuHost is a modern day, multitasking, multimedia software application utilizing many of today's advanced computer technologies. One of the most exciting technologies recently added to CompuHost is formally known as "DirectX". This technology allows for Video and Audio enhancements never before possible. CompuHost will continue to grow through the use of this, as well as future technologies as they come available. However, the use of these technologies often requires the support and/or compatibility with the underlying computer hardware. Understanding that many older, or possibly less expensive newer computers may NOT offer support for these latest technologies such as DirectX, CompuHost offers TWO Operating Modes, "STANDARD - Legacy/Compatibility Mode", and "DX - Enhanced Feature Mode". Offers support for older, or less expensive newer computers that DO NOT offer support for the latest technologies such as DirectX 9.0 or above. Some CompuHost features and functionality are NOT available while operating in this mode, therefore this mode should ONLY be utilized if unable to properly utilize the more advanced DX Enhanced Feature Mode. This mode utilizes the latest DirectX 9.0 Video and Audio technology and thus offers Features and Functionality not possible while operating in STANDARD mode. Among these features is the ability to dynamically change Tempo, the ability to display alternate Karaoke Lyrics Background images during Karaoke Performances, and the improved CPU loading resulting in overall better performance. 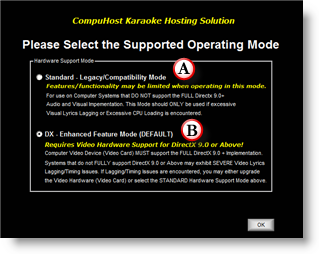 IF KARAOKE LYRICS DISPLAY LAG/TIMING ISSUES ARE ENCOUNTERED, THE VIDEO DISPLAY HARDWARE (VIDEO CARD) EITHER DOES NOT OFFER FULL SUPPORT FOR DIRECTX 9.0 OR ABOVE, THE VIDEO DEVICE DRIVER IS OUTDATED OR THE DEVICE IS MISCONFIGURED. IN THIS CASE YOU SHOULD CONTACT THE VIDEO DEVICE MANUFACTURE FOR AN UPDATED DEVICE DRIVER AND/OR RECHECK THE VIDEO DEVICE CONFIGURATION. IF NONE OF THE ABOVE STEPS IMPROVE THE VIDEO DISPLAY PERFORMANCE, YOU MAY EITHER UPGRADE YOUR VIDEO DEVICE TO ONE THAT DOES OFFER FULL SUPPORT FOR DIRECTX 9.0 OR ABOVE, OR UTILIZE THE STANDARD - LEGACY/COMPATIBILITY MODE.